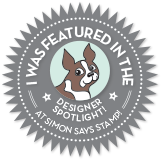 This weeks Simon Says Stamp Monday Challenge is Young At Heart. I had random ideas floating through my head and then I came across this set of photos of my family and decided that since my family keeps me young at heart it would be perfect. The background started with pink and orange dillusions paint, once dried I used clear embossing paste through a flowery stencil. I loved the texture it provided but unless you were staring at it you couldn't really see it so I used Tim Holtz purple spray stain, sprayed over where I stenciled and then buffed it with a paper towel leaving a light trace of purple where the flower voids were from the stencil. I then used thinned down acrylic white paint and splattered it on the pages, sprinkled silver heart confetti and black glitter over the wet paint. I layered the photos on textured white cardstock that I had stuck down where I wanted it. I used the same purple spray stain on cardboard letters for the word family and then used extra heavy gel medium to stick it down. I used black lava paint through a stencil for the LOVE and MEMORIES. Used metal embellishments next to the pictures of the kids. I'm really proud of the way this turned out. I love my family! !